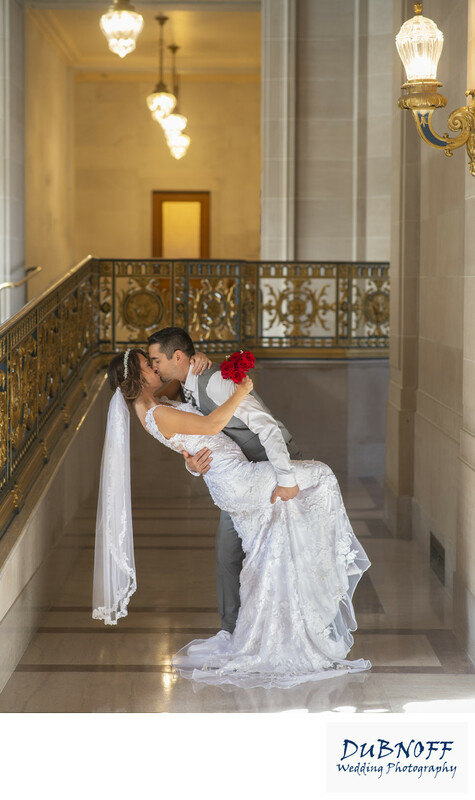 We asked this couple do do a little bit of a dance type of dip during their wedding photography session at SF City Hall, but never dreamed how low the groom would dip the bride. This photograph doesnt even show how far down they went, he had her almost parallel to the City Hall 2nd floor. This was a very fun couple to work with and they wanted to try everything we suggested. Some couples like to really go for it, which we love. But we are happy to work with all kinds of couples from the shy to the super outgoing ones.